Bavaria (Bayern in German) might epitomize what you think about when you think of Germany... oompah bands, Lederhosen, beer, sausages and lots of fun. ...but it IS a very pretty and fun part of Germany to visit. It is justifiably one of Germany's more popular tourists destinations. Castles like Neuschwanstein and Hohenschwangau to beer festivals like Oktoberfest in Munich. 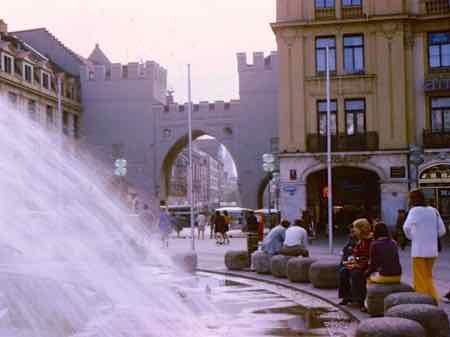 Munich deserves a page of its own. Nuremberg (Nurnberg), with its medieval city walls and its Christmas market (Christkindlesmarkt), is a big city, but its compact center is very walkable. You can tour the Nuremberg Castle (Kaiserburg) which was the the official residence of German Kings and Emperors. Art historians will be interested to see the Albrecht Durer House. We toured this city with a German friend, and he loved it. Almost any town, large or small, in this region seems historic and picturesque. Germany's Romantic Road runs through the heart of this region. It starts in Wurzburg and ends in Fussen near Munich passing though several well preserved towns like Dinkelsbuhl and Rotenburg ob der Tauber. Wurzburg is a vibrant university town and is worth a visit to see the Residenz, the Prince Bishop's Palace. Also see the Fortess Marienberg, the castle on a hill across the "Old Main Bridge". The Romantic Road in between Wurtzburg and Fussen is worthy of a couple of days of touring to see the well preserved towns along the way. Fussen is the small town nearest to Schloss Neuschwanstein. 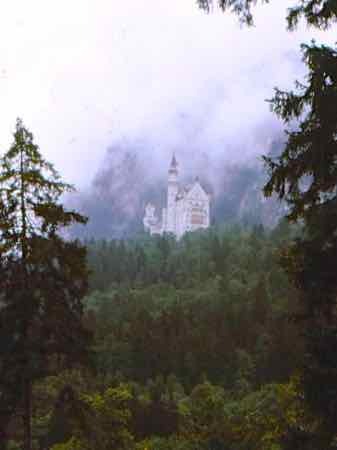 This most famous of King Ludwig's castles seems to float on its hill. On the eastern edge of Bavaria, just across the River from Austria, Passau is in a beautiful setting at the junction of the Danube, Inn and Ils Rivers. Visit the Castle across the river, the Veste Oberhaus, for beautiful views back to Passau. Many Danube River Cruise Boats dock in Passau to see the old city. Chiemsee is the largest lake in Bavaria. On the island of Herenchiemsee, Ludwig II built another of his palaces... a mini-Versailles called Neues Schloss or Konigschloss. Take a boat over to see it... it's worth it. Oberammergau is famous for painted houses, wood carved sculptures and the Passion Play which is every ten years... 2010, 2020 etc. The third of Ludwig's castles, Schloss Linderhof is near Oberammergau. You can fly straight into Munich from several international destinations. 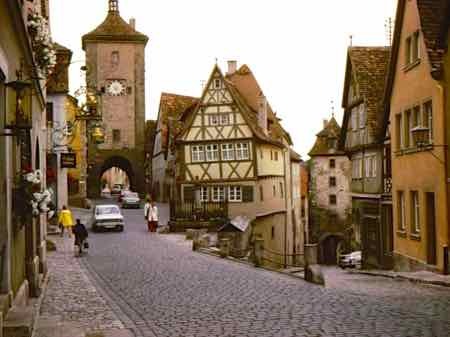 There are many bus tours for the Romantic Road. We think the best way to explore this area is to rent a car and just ramble. You'll find nice hotels and bed-and-breakfasts everywhere with lots of pine woodwork and big fluffy down comforters. Order a beer and sausages and enjoy all the delights that Bavaria has to offer.